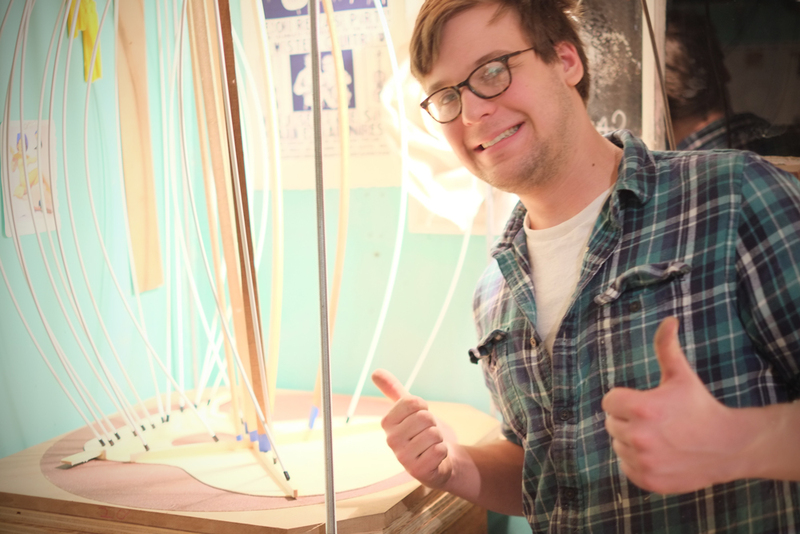 So my pal from Red Wing/Minneapolis came over for a special shop project. 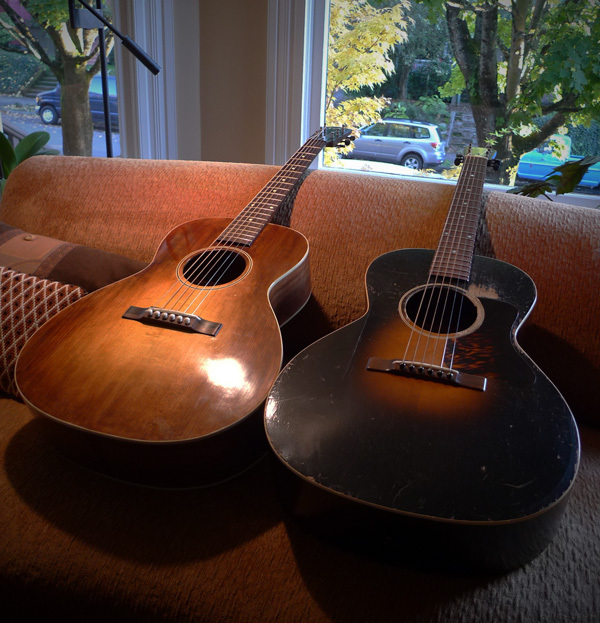 We decided it’d be fun to try to build a guitar in a week, from start to finish, and then put it through it’s paces at the 16th annual Portland Old Time Music Gathering the following week. 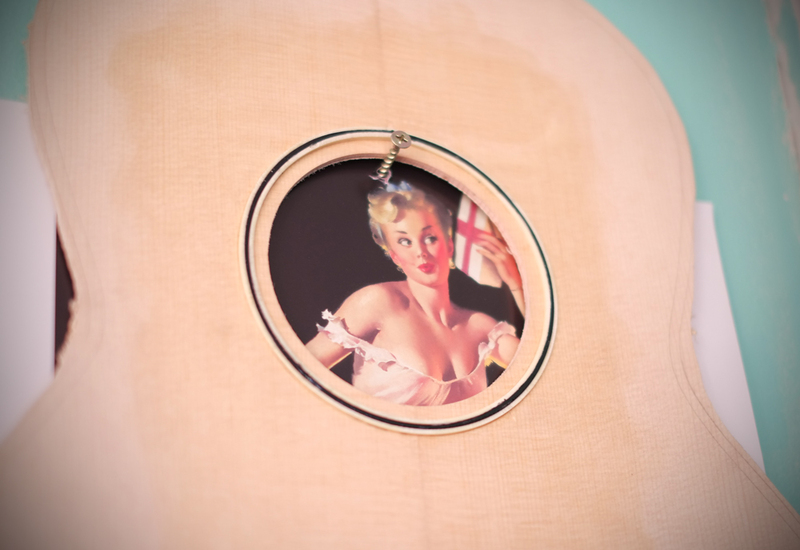 We figured that we’d build a classic 1930’s guitar in 1930’s Gibson style—fast and loose, top-bound and stenciled. 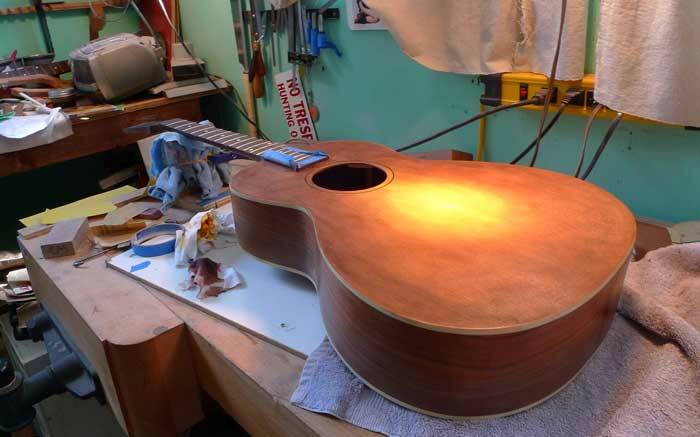 We were inspired by our friend Todd Cambio at Fraulini Guitars who one time built a guitar in three days (by himself!). Aaron arrived tuesday morning at 10am, and while I was working at City Bikes, he got the plates joined and thicknessed. 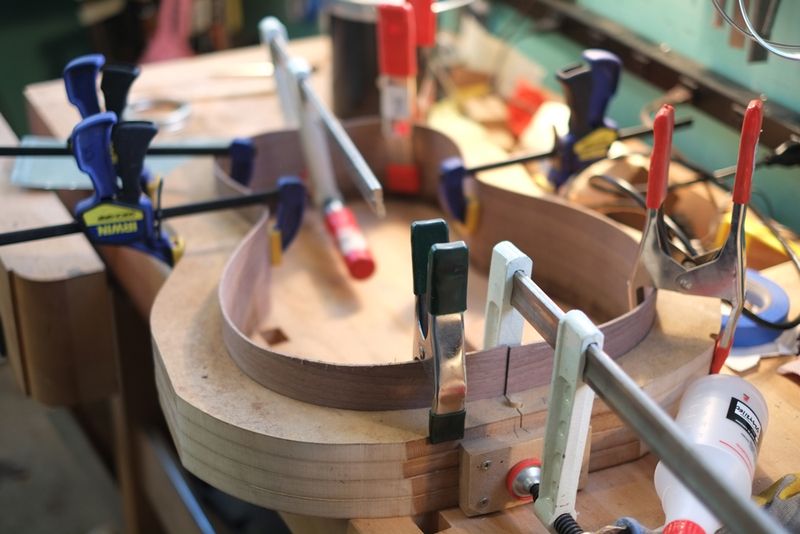 The next day, we got plates profiled, ribs bent, blocks glued in, back kerfing in, rosette installed, back braces glued, major top braces glued. We ate burrittos, drank lots of espresso, and stayed in the shop until midnight. We’re on target to have the box closed today! Stay tuned for more! 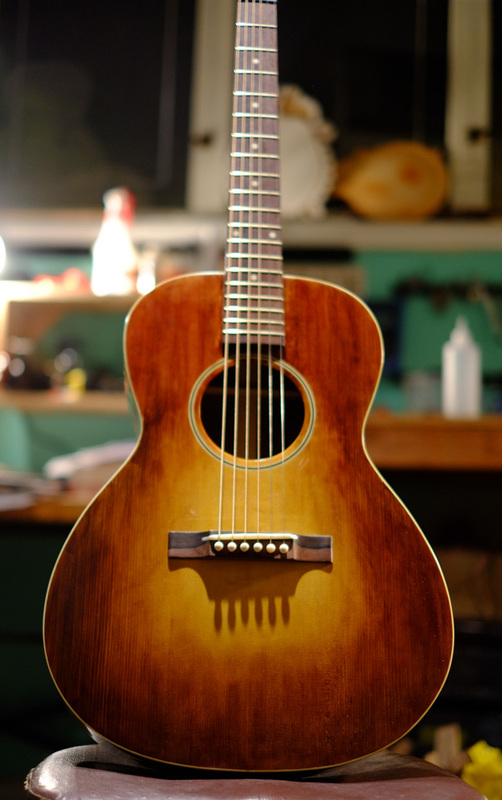 So we had a 1938 Martin D28 come through the 12th Fret the other week, and I thought I’d pass on some photos. 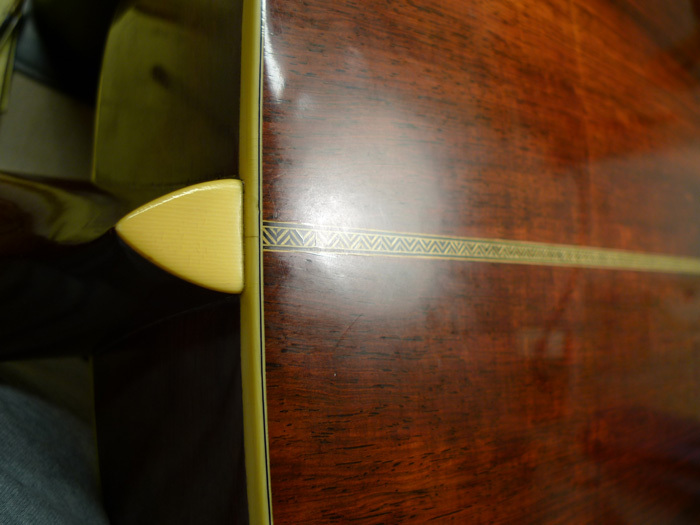 Considered the epitome of a dreadnought, this Herringbone D28 would have been completed during Martin’s golden period, while they had perfected the (becoming very) popular dred shape, built very lightly and with fine Red Spruce and Brazilian Rosewood. 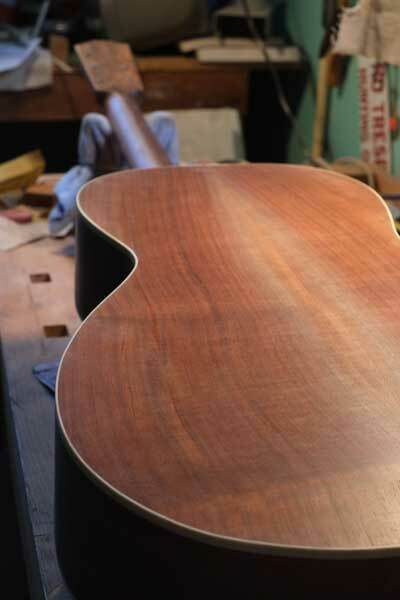 This era of Martins are certainly wonderful sounding, and consistant for both the fine fit and finish, but particularly have the most elegant neck carves and elegant appointments. 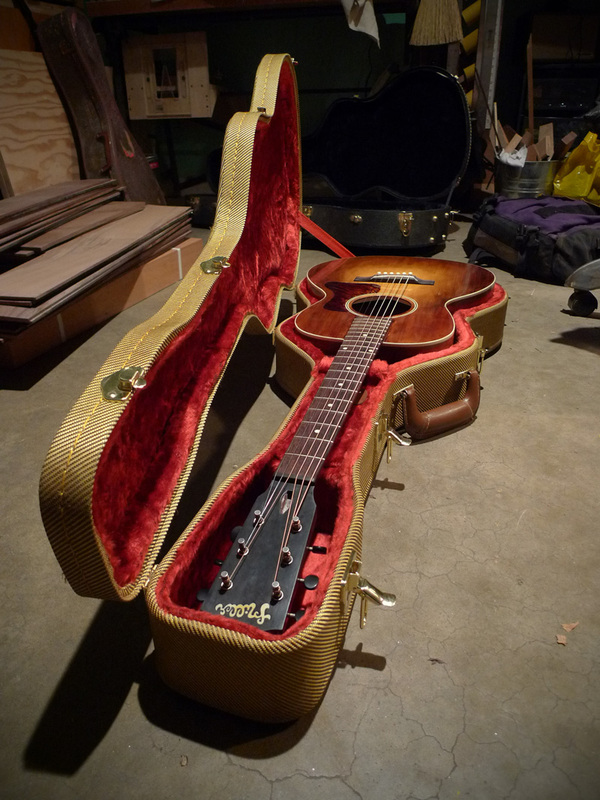 They occupy the pinnacle of collector prices for factory-built guitars, often selling for upwards of $100k. 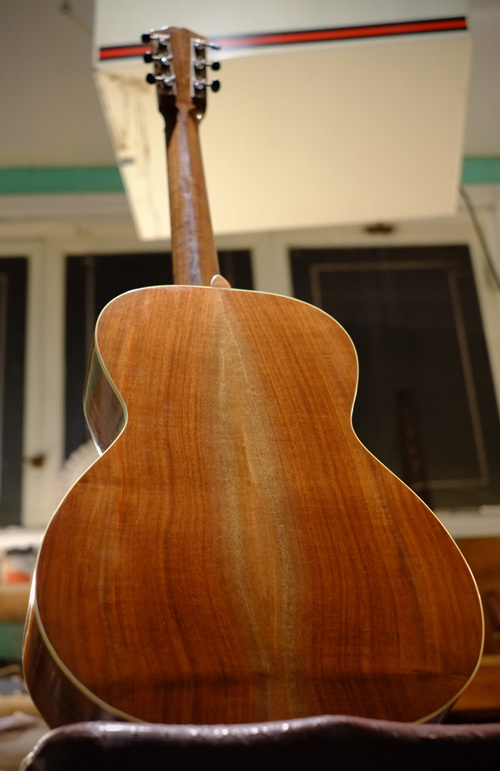 Here are just a few more photos of the Walnut L-OO. 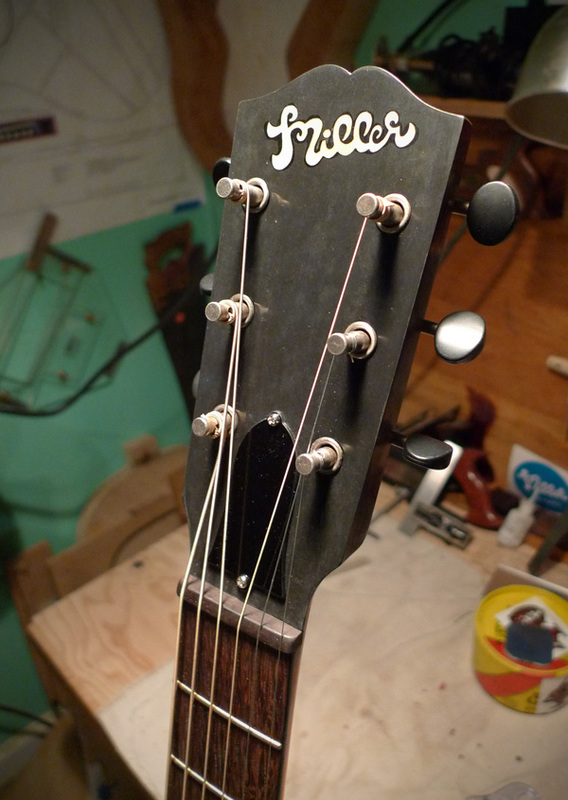 The truss rod cover was cut from a sheet of acrylic, the nut is ebony, and the bone saddle now glued into the bridge with hot hide glue. 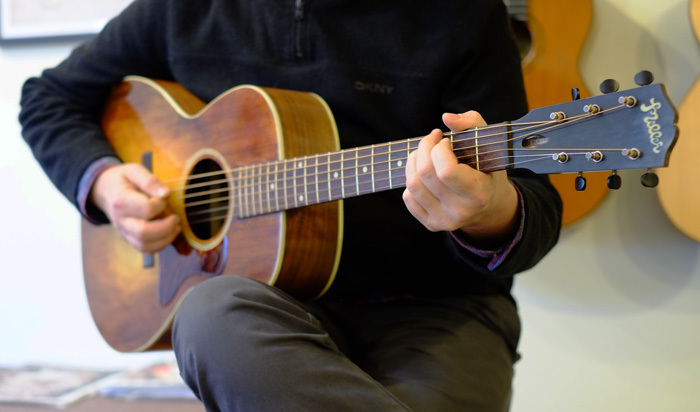 The guitar experienced a very mild settle-in over the course of the last week, although the Portland area was experiencing a very dry period, with the RH dropping to 27% at times, compared to the 60-80% we typically expect. 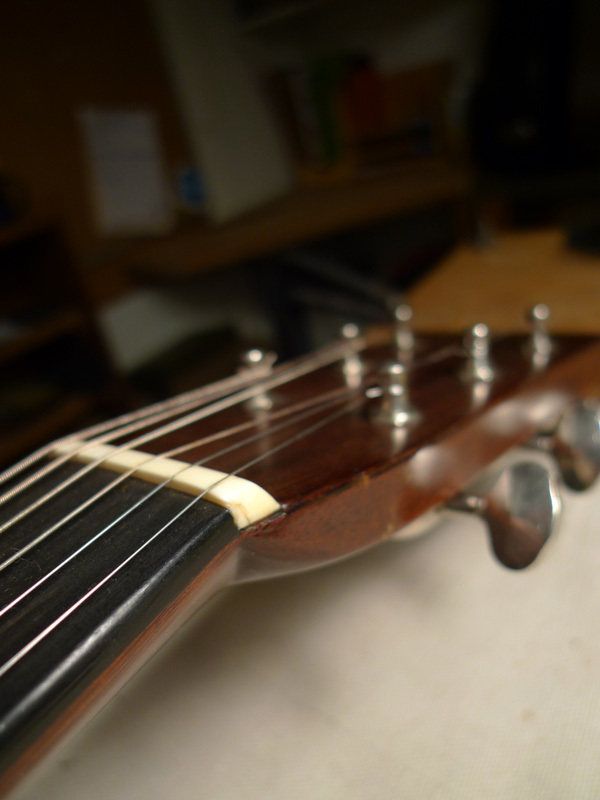 The guitar is changing day to day in tone and timbre, sounding very woody and is a real pleasure to play. 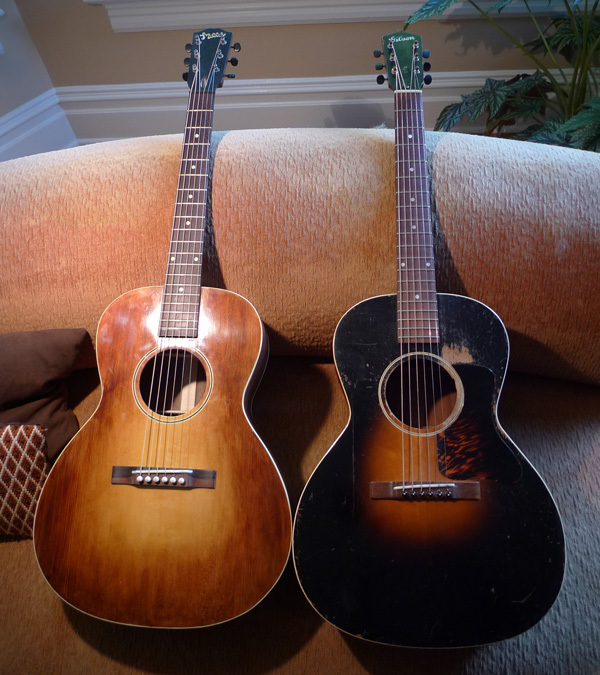 Compared to a ’34 L-OO. Very different ‘burst, but pretty close in other regards. 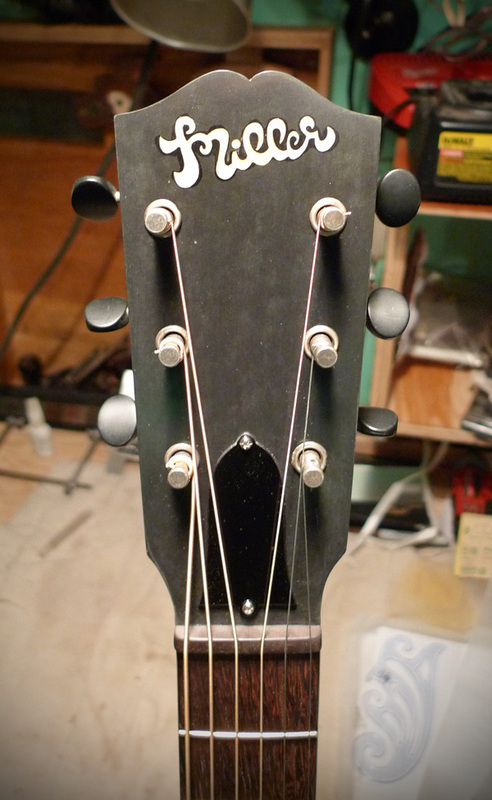 This was before the pickguard and truss rod cover, of course. 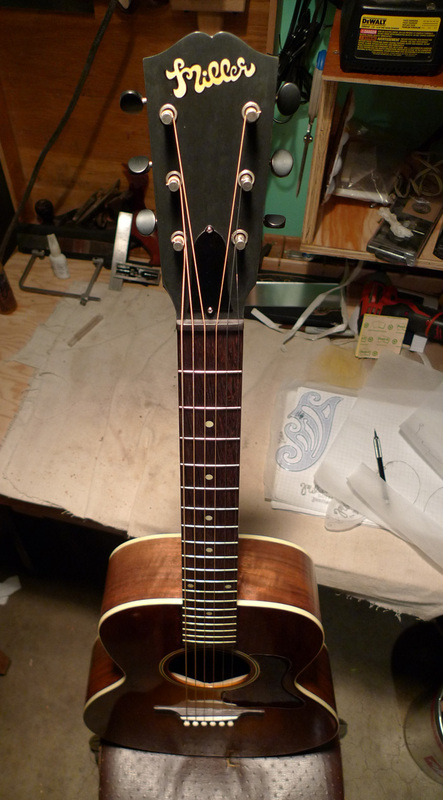 All strung up, and sounding fantastic! 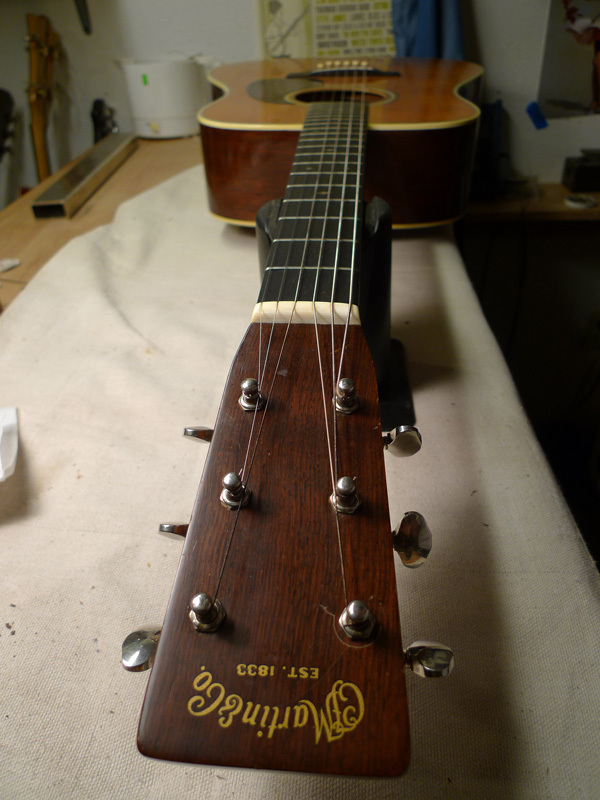 I was able to do a A/B test with a really good ’34 L-OO and it sounded remarkably similar, albeit very very new sounding. 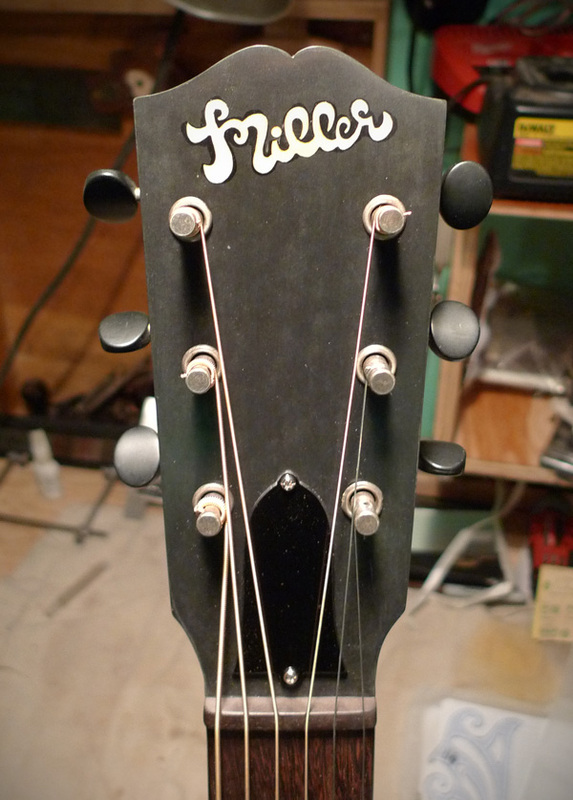 All that is left is a truss rod cover, label, and a final setup after a week or so. 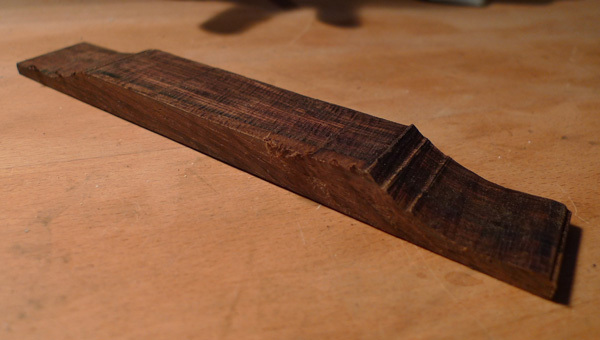 This Brazilian bidge blank has a footprint prepared with a 20′ radius, and is rough cut from the bandsaw. 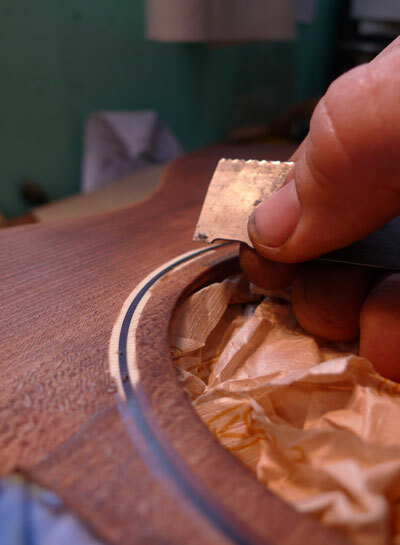 The bridge gets glued on with hot hide glue, using cauls on both sides of the bridge/bridge plate. 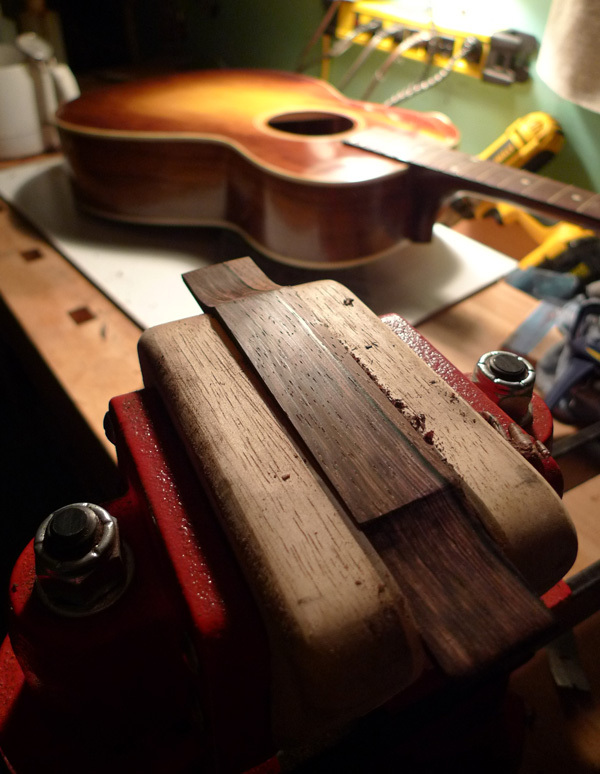 I made the bridge plate caul while the top was off the guitar, so the bridge will get some nice full-clamping action. 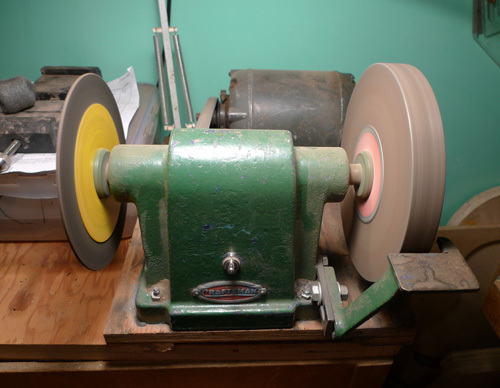 I wanted to introduce one of my favorite shop setup: the John Sullivan Tool Grinder. 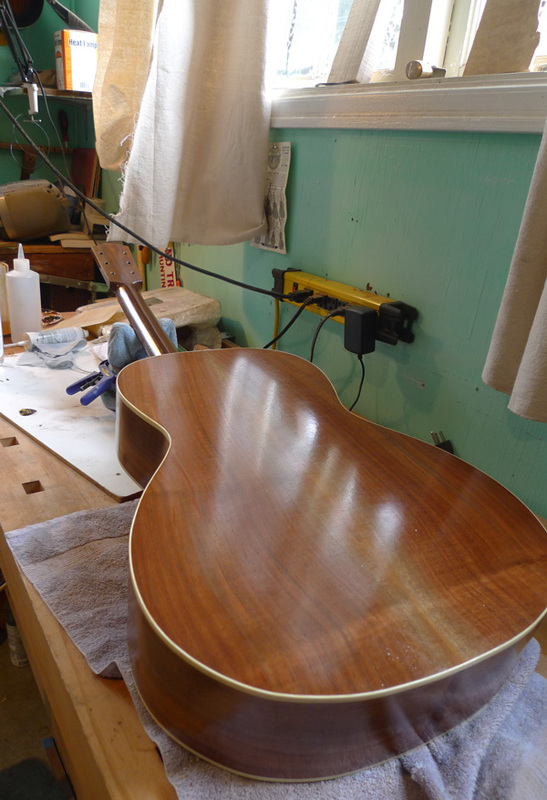 Having acquired a number of tools from the Sullivan Estate, I’ve begun to figure out some of the genius setups that Mr. Sullivan employed to make his fantastic mandolins, guitars, and violins. One of which is this grinder setup, with uses a thick cutoff wheel for shaping, and a fine wheel for grinding a cutting edge. With this combo, I can whip out a number of custom scrapers and other edge tools, and have a usable edge in moments. 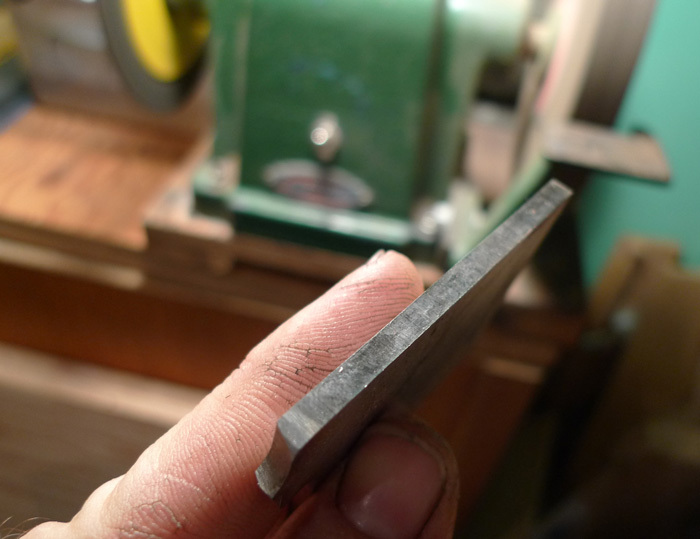 Lately, I’ve been enjoying these very thick tool steel scraper, made from what appear to be old planer knives. Thanks, John! 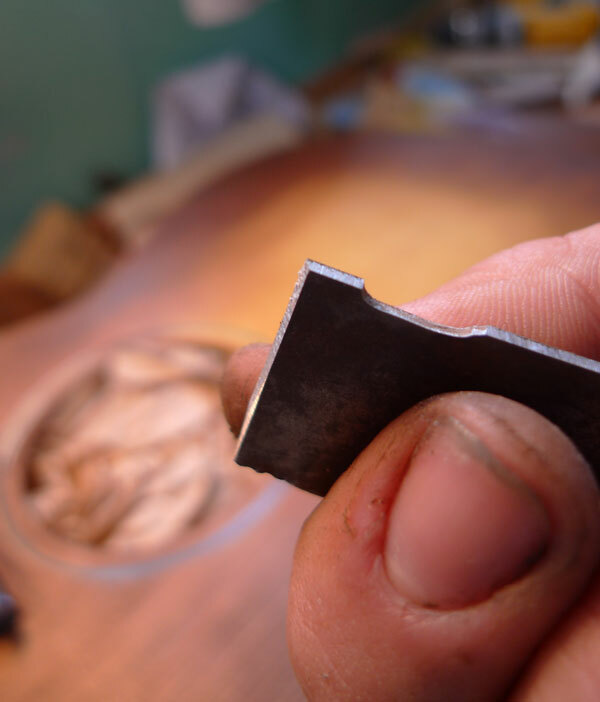 ground at 90 degrees and lapped on either side, you get twice the cutting edges to use before regrinding. 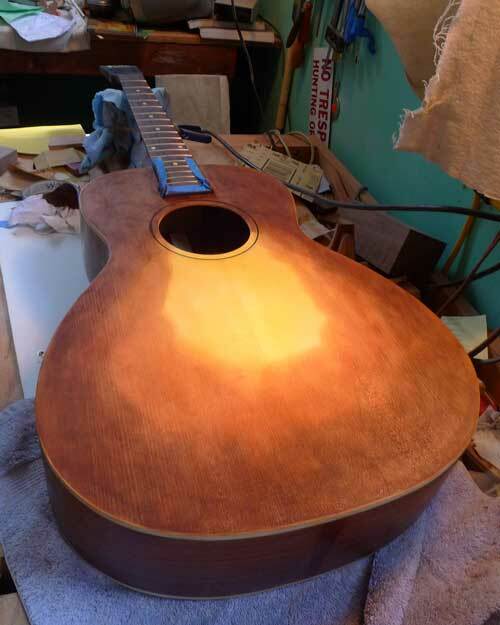 Just a quick update, showing the progress as I add layers of shellac to the guitar. 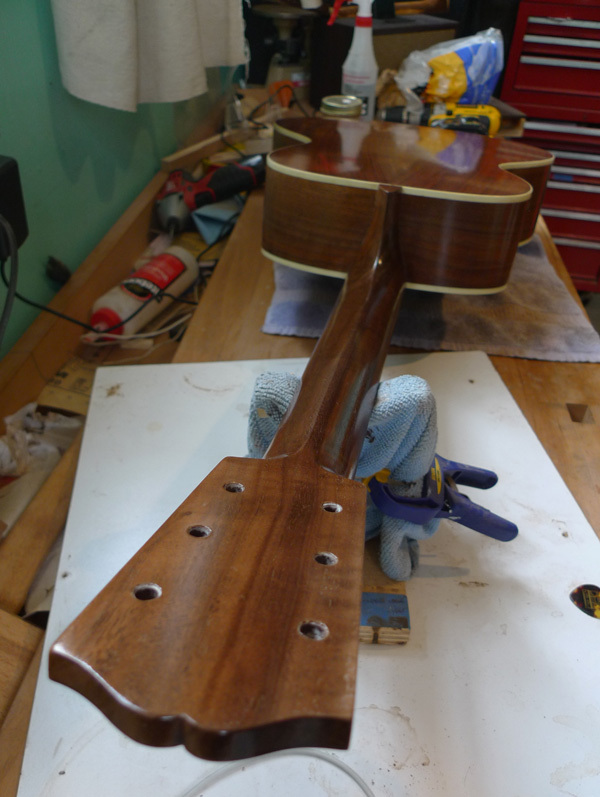 It is wonderful to see the depth the finish adds to the already glorious walnut and spruce. 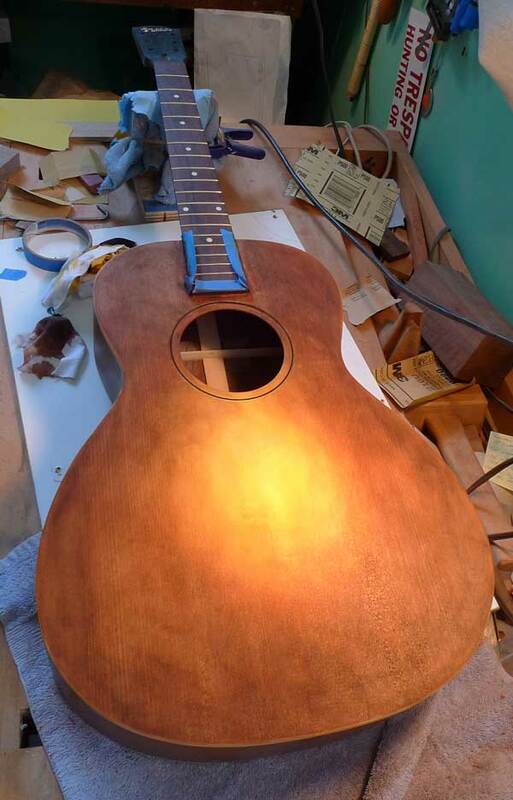 The finish process is very delicate and I’m learning quite a lot this time around. Next shop project is a spray booth! 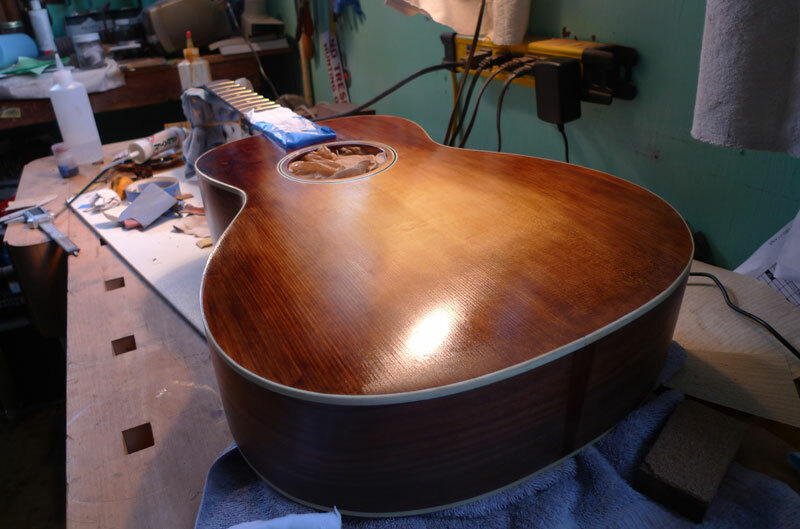 Coats of Shellac are “polished” on using a cotton pad. Slow work but very enjoyable. 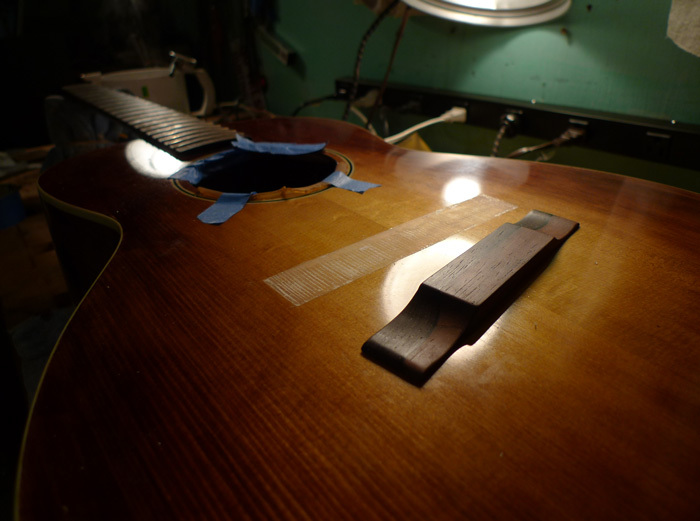 The next step is “spiriting off” of the Shellac, where the surface is polished smooth and awesome. I ground a scraper to clear the rosette of sunburst/sealer, it does a wonderful job of scraping the whole rosette at one go. 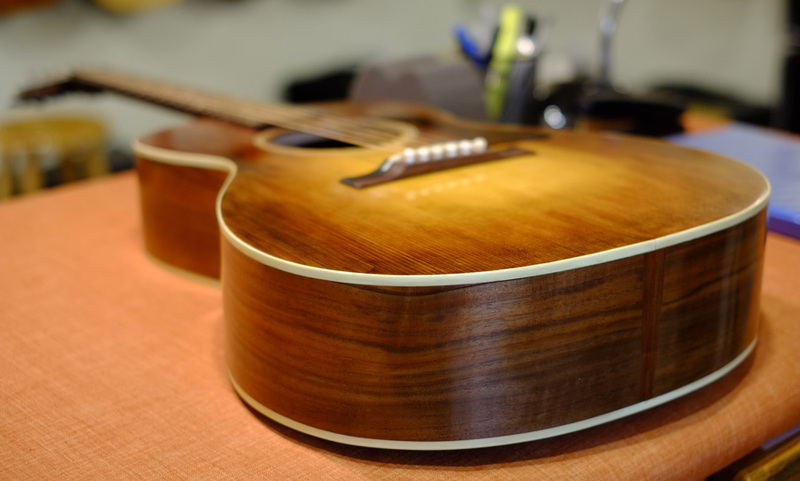 the first sealer coat of shellac really brings out the beauty of the wood, as well as the color. 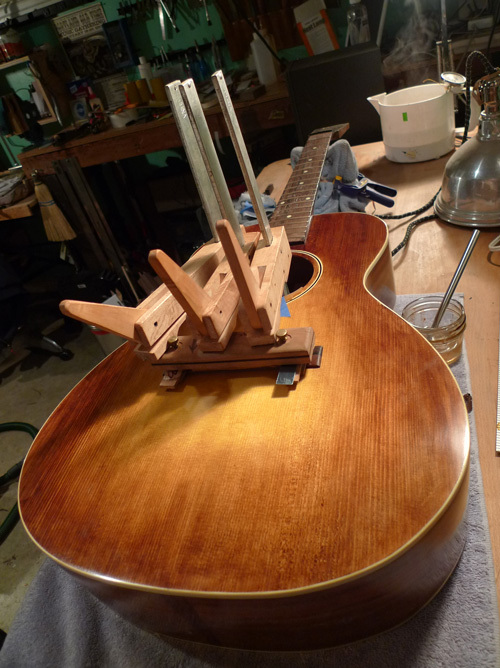 The L-OO has received a shellac/pumice pore fill, to fill the large pores of the Black Walnut. 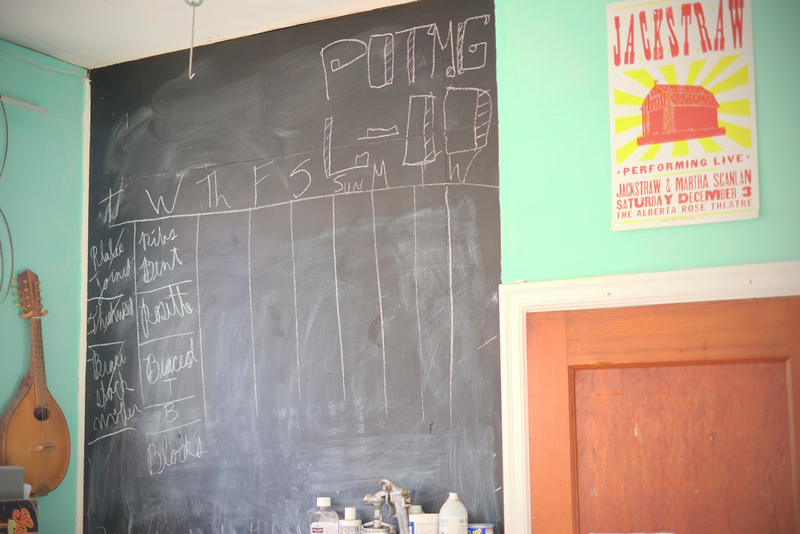 Rather than add a heavy, messy layer of pore putty, the pumice process is non-toxic, clean, and beautiful. 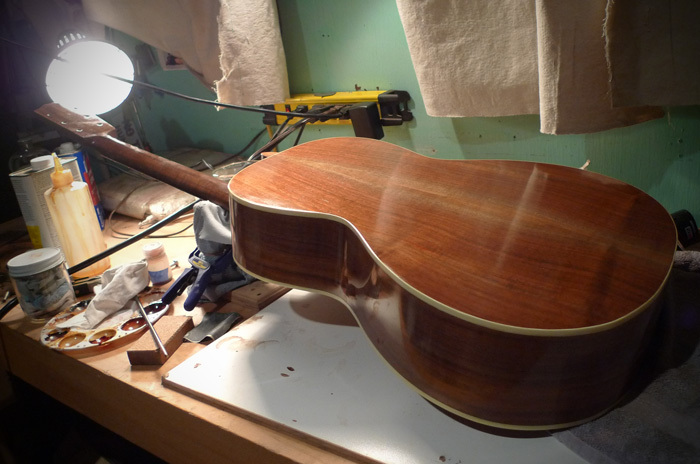 The guitar is lightly powdered with the fine pumice, then a 1 lb cut of shellac is polished over top. 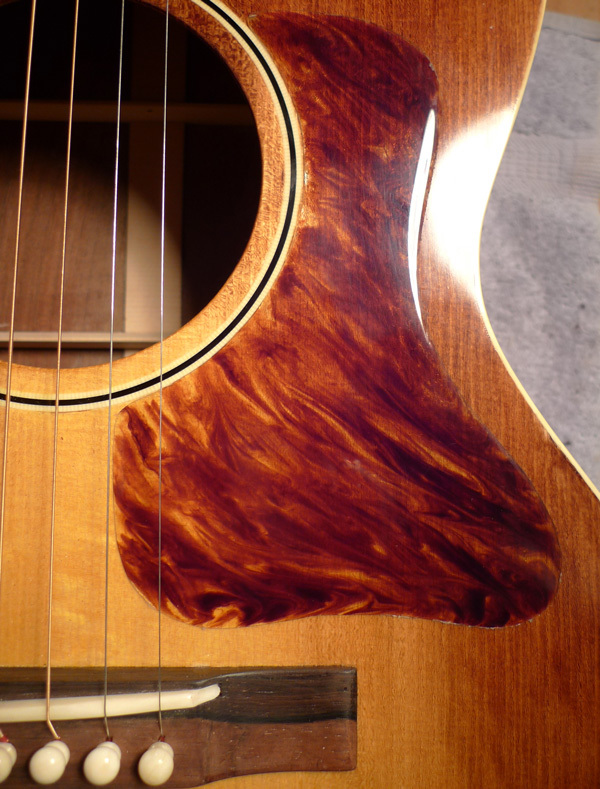 The pumice abrades the wood and takes on the color while filling the pores. 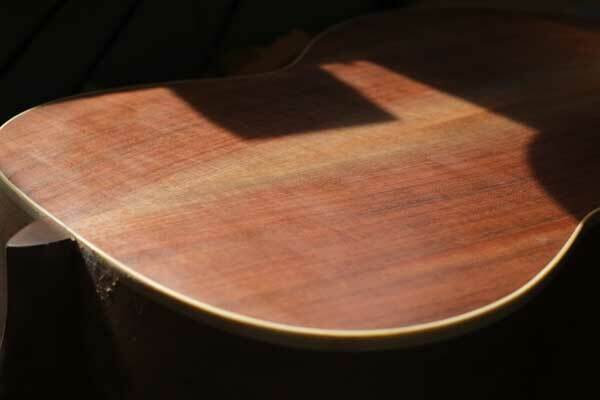 It does take some time, and is far easier to partially fill pores, leaving a hint of their presence, rather than to completely fill them and have a glassy surface. I like it. 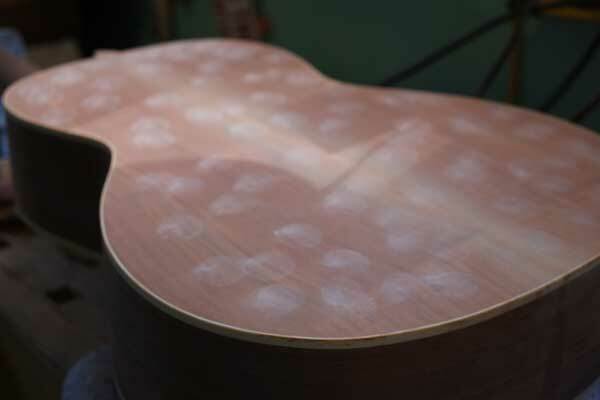 Just today, I’ve given the entire guitar a couple of sealer coats of fresh blonde shellac, and although there aren’t pictures, it is beautiful and shiny! 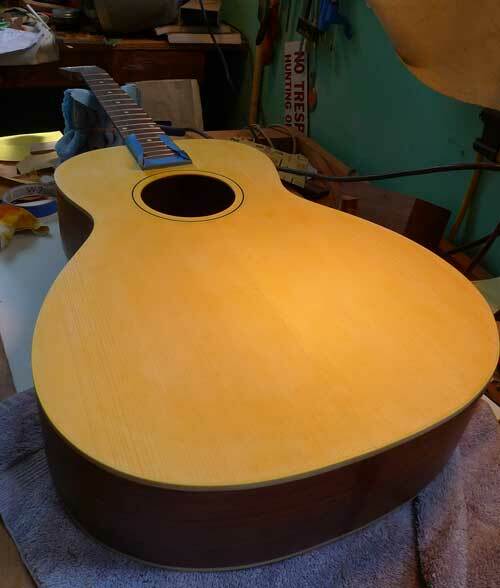 Next up, I’ll level the sealer, and french polish the rest of the finish on the guitar. 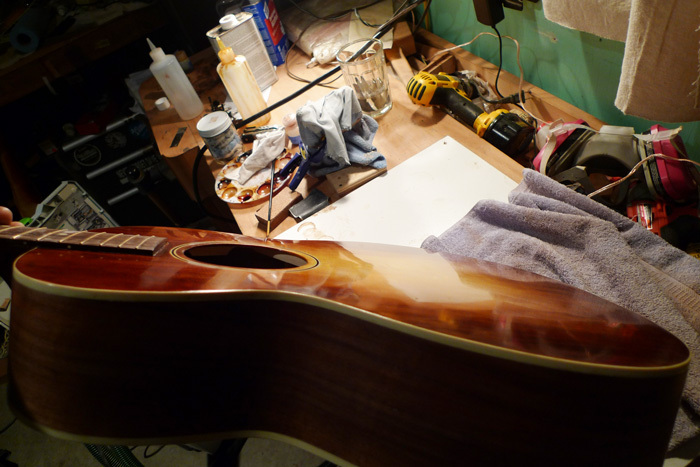 While the finish cures, I’ll make the bridge, and go mountain biking! 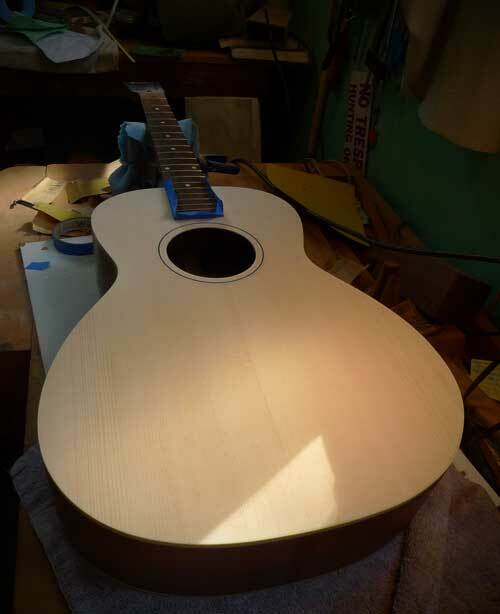 The back, sides, and neck are finish sanded to p320. The pumice is powdered onto the surface to be filled. 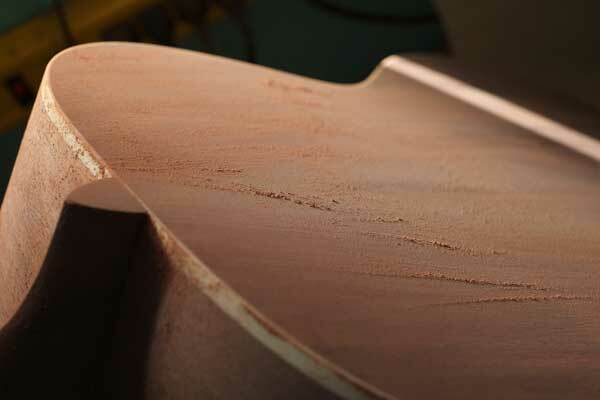 The pumice is worked into the surface across the grain, first in a circular pattern, then in long cross strokes. 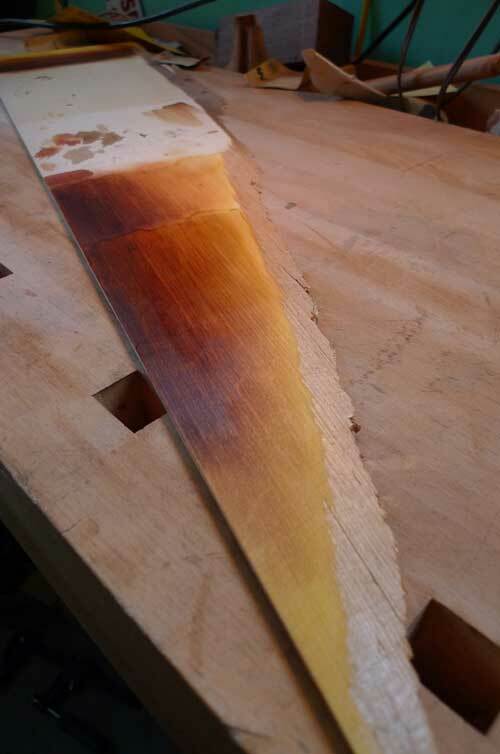 First step is to apply a honey amber aniline dye. lastly, the colors are rubbed out. 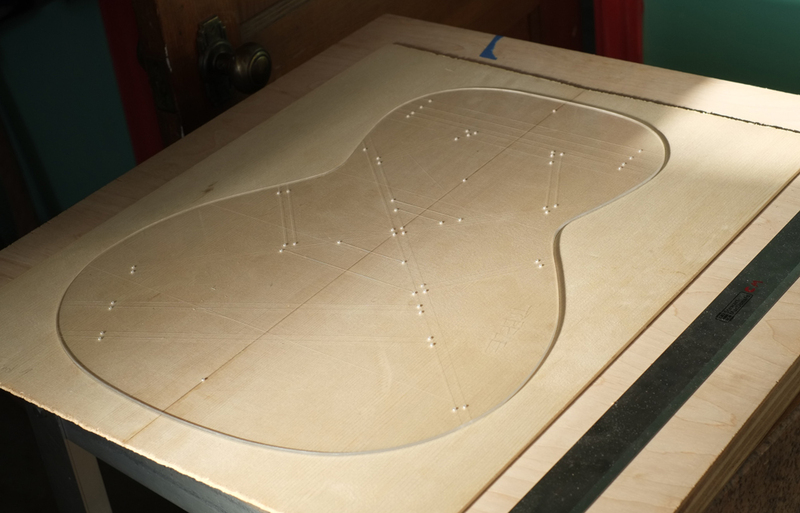 This is a tricky part. 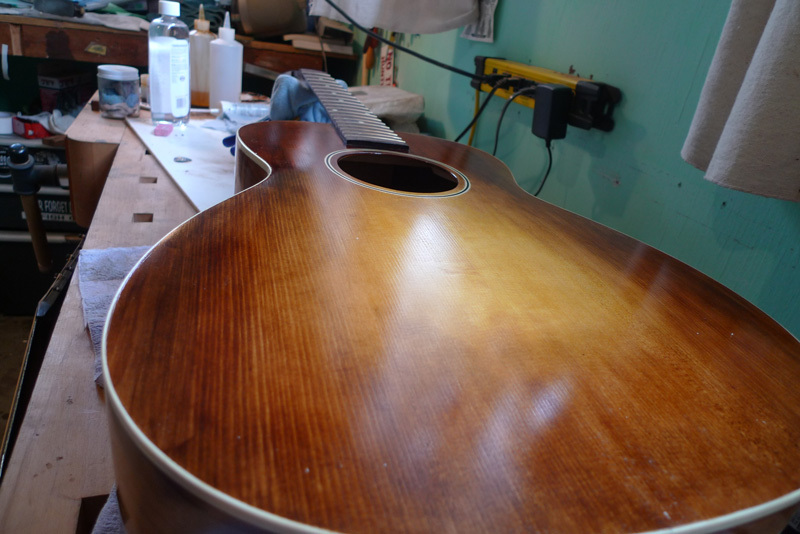 Next will be a careful sealer coat of dewaxed shellac, then the french polish process will begin. 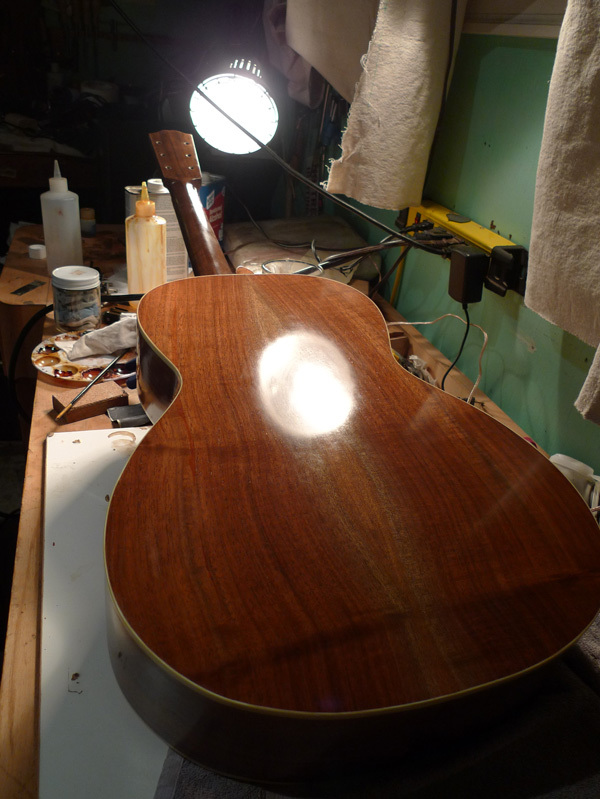 I’ve already pore-filled the back, sides, and neck with a pumice-and-shellac process. More pictures to follow in a few days!